High capacity additions in both state owned ports as well as private ports on both the west and the east coasts will dent the business performance of container terminals in the medium-term, a rating agency report said. On the west coast, the over-capacity concerns stem from the state-run JNPT, the largest container port in India already handling over half of the volumes, planning to double its capacity with the addition of the fourth terminal. On the East coast, the Chennai-Ennore-Kattupalli- Krishnapatnam cluster, which has seen significant capacity being installed, is also likely to face strong competition for volumes over the next 3-5 years, it said. Chennai port alone has an installed cargo handling capacity of 130 million tons while the port handled 51 million tonnes of cargo last year. 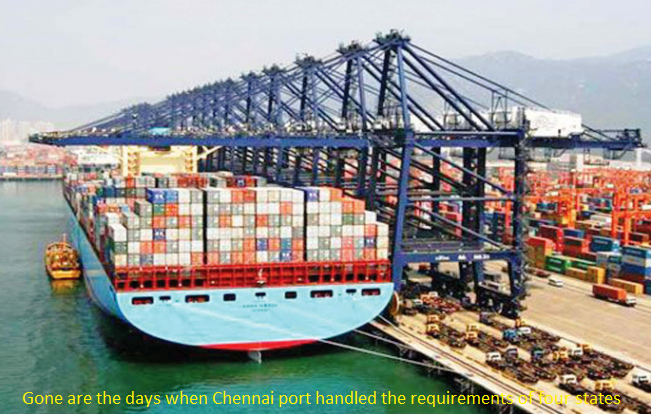 Gone are the days when Chennai port handled the requirements of four states. At present there are four modern ports in and around Chennai. The pressure on realisation and margins is imminent as the lines drive a hard bargain on rates," a spokesman of the rating agency said. While the recent capacity creation in these regions is backed by prediction of strong demand growth, increase in exim cargo movement would be gradual and in the interim, terminals could witness pressure on volumes," he added. Given the high leveraging of some private sector port operators and concerns on returns, he said "consolidation trends could gather further momentum going forward". He, however, warned that credit profiles could come under pressure on account of any leveraged merger and acquisition transactions, recurring cargo related setbacks or any adverse movement on tariff related litigations. "A prolonged decline in coal import requirement in the absence of diversification into other cargo categories can impact the returns for such port sector players," it said. In the near term, the cargo and cash accrual outlook for the port sector overall is positive, it said.